The ornamental skull has become a familiar mordant feature of the artist’s box of tricks over hundreds of years. In the Western tradition, this can be traced back to Vanitas, still-life paintings that confront us with the irresistible trajectory of time, impelling all life towards mortality. More recently, Damien Hirst inimitably seized the enduring trope for an extended dialogue between art and money, by covering an anatomical copy with high carat diamonds, cut to fit the contours of the head. But several years before Gabriel Orozco had employed this subject when he was recovering from a collapsed lung. Spending many hours in recuperation, he purchased a real human skull in order to draw directly onto the surface (apparently there are two outlets in New York City where such an object can be legally sourced). ‘Black Kites is perhaps the most engaging object in Orozco’s retrospective at Tate Modern. 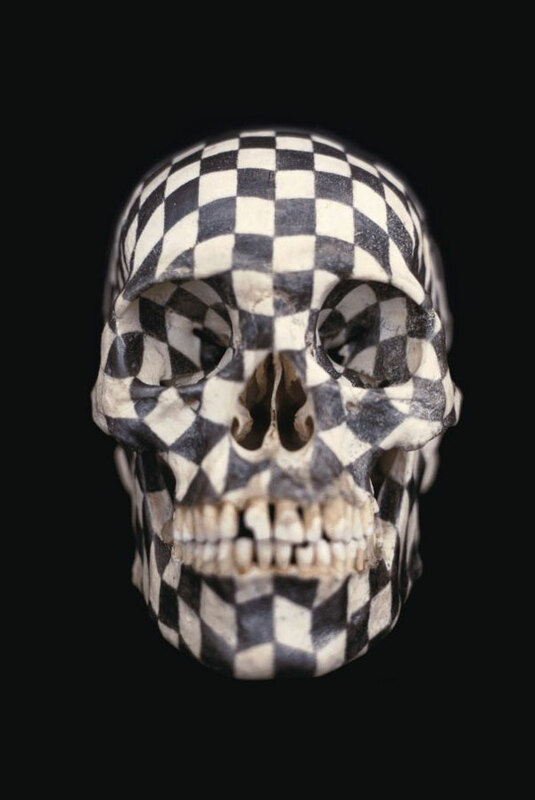 Stripped of any individualising fleshy features, the ivory-toned skull now caries a chequerboard pattern of black squares that slip into elongated diamonds as Orozco moves with his pencil into the recesses of this bony head. The shock of standing before human remains, far from the catacomb or archaeological display, is upstaged by the skillful handling of the graphite two-tone effect by which the artist maps and probes this repository of human instinct, knowledge and experience. An evident uncanny, creepiness is overlaid with decorative excavation. Such a darkly humorous and ornamental approach to the skull returns to us Orozco’s native Mexico, to the religious iconography of Aztec heads and more recently the Catholic appropriation of pagan ritual in the Day of the Dead where skeletons are dressed up and decorated in an annual danse macabre. And so Orozco’s eclectic employment of differing sources and materials may explore a similar thematic interest. La DS, a modified Citroen car, sits displaced from the street as a hyper-real object sharing the same distinctive profile but viewed from the front, it becomes clear that the artist has removed the engine, narrowed the body and welded together what remains to produce an uncanny alteration that leaves the viewer with enough information to read the object as a familiar product but shorn of its functionality. We are left with an exaggerated, streamlined approximation of speed and movement that is disconcerting. A few metres away within the same gallery, Orozco places an irregular, stained ball of indeterminate material on the floor. We learn that it is in fact constructed of plastercine to match the artist’s exact weight. ‘Yielding Stone’ is an object that carries layers of experience and memory embedded in its crusty skin, for this humble, inconsequential blob has been rolled around as a witness to Orozco’s nomadic wandering in real physical environments. It becomes an autobiographical repository of multiple encounters and sin a subdued fashion articulates all that has shaped it. In a series of photographs, the conceptual gives ground to a more lyrical quality: the moist residue of breath sits momentarily on top of a reflective, lacquered piano; a squashed football hosts a rainwater puddle; a showerhead resembles a photograph of the comos taken from a satellite. These images play on the open-ended power of suggestion, which Orozco most fully realizes in a series of creased paper images conjured out of creased paper and oil based paint and begin to resemble ‘ink blot’ tests. Elsewhere, Orozco reclaims the most abject and disregarded materials for the purpose of art. Stretched layers of fabric fluff, human hair and skin hang loosely on clotheslines. Formed around the drums of tumble dryers in New York Laundromats, these formless and indeterminate residues neatly summarise Orozco’s quixotic quest for revelation in the material world. This bathetic teasing strategy is most explicit in his empty shoe box first exhibited at the Venice Biennale which feels firmly established in post- Duchampian tradition but instead of outrage induces little more than ennui. Orozco is capable of overreaching in his hunt for lyrical transformation. In a site-specific work made for the exhibition, ‘Chicotes’, fragments of left lying in the road after car tyres have exploded, which lacks either beauty or surprise. He over-eggs this pudding by dripping pools of liquid aluminium over some of these frayed rubber strips resembling melted wheels and car parts, so suggests the curator grasping at a viable interpretation for a piece that does not feel fully formed. But the work still manages to embody entropic inevitability within the material world and perhaps unconsciously reminds us yet again of vulnerable flesh for the piece is unavoidably reminiscent of animal parts and pelts found dismembered in an abattoir.